XL Video is supplying world famous dance company Sadler’s Wells with a projection system for ‘m¡longa’, a new work by the brilliant internationally acclaimed Belgian born choreographer Sidi Larbi Cherkaoui, which was inspired by the magical communication of tango dancing the intimate, almost conspiratorial social setting of the m¡longa (social tango dances). XL Video’s Ed Cooper is the project manager. XL Video has worked on several previous projects with Sadler’s Wells including recent tours of Russell Maliphant’s ‘Still Current’ and the world tour of ‘TeZukA’, another mixed-media Cherkaoui production using the stylised imagery of Japanese Manga cartoons as a starting point. 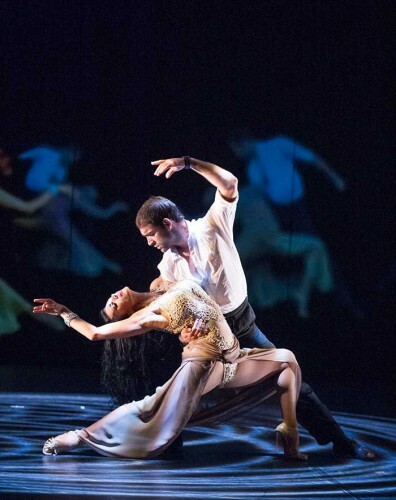 Sadler’s Wells production manager Adam Carrée once again called on the skills and expertise of XL Video to provide a video solution for the m¡longa tour – with the current tour making its UK premiere at their north London base. Carrée is also the show’s lighting designer, with projection and video design by set designer Eugenio Szwarcer and all collaborated closely including Szwarcer’s Assistant, Paula Bosch. 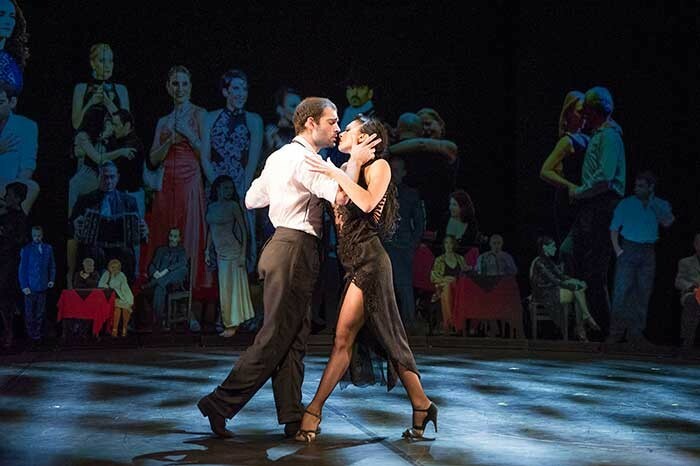 The performance features five Argentinian Tango couples who have danced together for many years and one contemporary dance couple in an exciting, highly charged and emotional masterpiece of movement that explores the tradition genres of Tango from a completely different cultural perspective. Of the five projectors, four are Panasonic DS100XEs, all fitted with 0.8 short throw lenses and run as two doubled up pairs for maximum brightness. Two DS100XEs are located at the downstage corners of the stage and projecting onto mapped cutouts of people making up part of the set and bringing depth to the stage. The other two are rigged at steep angles on upstage lighting bars front projecting onto a full stage width set piece which in turn divides into five separate sections, each moving into different positions throughout the show. The fifth projector is a Barco R12+ which is rear-projecting onto a downstage gauze filling the proscenium arch which flies in to break up the setting for the m¡longa and takes us outside into the Argentinian streets. Lightware DVI over powered Neutrik Fibre individually feed each projector via a Barco 8x8 DVI Matrix Pro populated with main and backup Rackmount Datapath X4s that split the signal to allow for extra outputs. These are all supplied in a rack dovetailed to fit in with Sadler’s Wells own Catalyst Media Server set up, which is utilised to store and play back the content. Video is toured and managed by Oscar Lisshagen working alongside the Sadler’s Wells touring crew. m¡longa continues in Europe until December and is currently scheduled to resume again in April 2014.